The NAPDRT (National Alliance of Paintless Dent Repair Technicians ) is a “Not For Profit” organization which was formed February 2005 and officially launched September 2005 accepting new members. The organization has grown with hundreds of independent techs supporting it’s cause over the years. The group was formed to help unite and protect the PDR trade. Working hard to promote and protect has always been the intention. One significant achievement was testifying and working with law makers in New Hampshire making it illegal to purposely or deliberately underestimate an insurance claim. They have always supported 3rd party certification and work to promote Vale and their efforts to certify paintless dent repair technicians. N.A.P.D.R.T. has sent board members to work with State Senators to repeal the Mc Carran Ferguson Act. 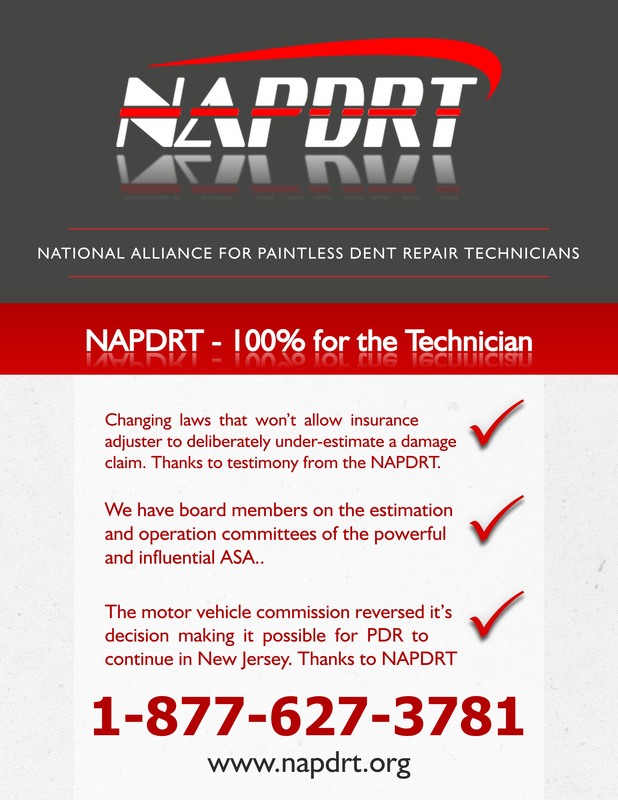 When the State of New Jersey shut down the paintless dent repair industry, they sent representatives spoke on behalf of all technicians and were able to reverse the Motor Vehicle Division’s mandate stating all PDR companies be licensed as body shops. The National Alliance of PDR Techs provides educational seminars at the Annual Mobile Tech Expo and NACE shows and are always in discussions with industry leaders at these events. 2014 is expected to be a great year for the group and it’s members. They have some new people on the Board of Directors who are very enthusiastic about making the industry and the group better. They have new and current members that are stepping up, helping, and bringing new ideas to the BOD. They are focusing their efforts towards working and discussing ideas with insurance companies to encourage them to deal with PDR companies and independent technicians on a professional level. Trying to encourage them to treat the highly specialized PDR industry with integrity and respect. 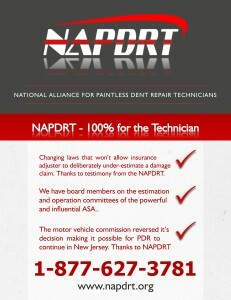 To learn more, you can visit the NAPDRT Technician Website. Read about the next term: Oil Can – When the metal is so stretched that it cannot be put back into place.